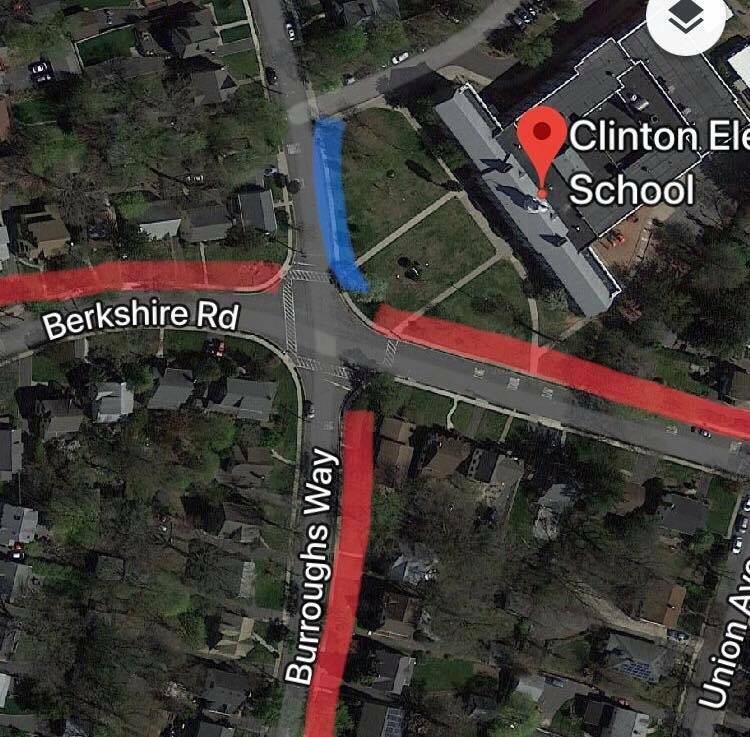 The time surrounding drop-off and pick-up (8 to 8:10 a.m. and 2:30 to 2:40 p.m.) can be particularly challenging for drivers and pedestrians around Clinton School. Whenever possible, leave extra time to account for congestion around the school, and remember that we are modeling behavior in front of our children, so please be courteous and show respect to others. The map shows the parking rules on the streets in front of the school. The RED areas all have the No Parking 8am-9pm signs, and the BLUE area is Buses Only/No Student Drop Off or Pick Up. In addition to marked parking areas along side streets, parking is also available at the Underhill Sports Complex (near the football field and track), which has a path that leads to the back entrance of the school. Please remember that non-service dogs are not permitted on school property.